In the context of dispute resolution, ‘US-style’ rarely denotes a positive quality. Be it for the brand of aggressive cross-examination practised in courts from New York to Nevada, or a class action system whose excesses are slammed by European legislators when introducing their own forms of collective redress, American lawyers are seen by many as having much to answer for. Such criticisms are to some extent offset by the influence such practitioners continue to exert on the global stage, with international arbitration being no exception. Indeed, London-headquartered Freshfields Bruckhaus Deringer aside, the industry’s busiest players are, to a firm, American. Given this predominance, it is to be expected that US-style practices would bleed into international arbitration – the most unloved and increasingly prevalent of which remains its approach to document production. Steven Finizio, Wilmer Cutler Pickering Hale and Dorr: The growth of the London Court of International Arbitration (LCIA)’s case numbers has been a notable development in recent years. Why are more and more parties now choosing the institution? Jacomijn van Haersolte-van Hof, LCIA: Our overriding – and unique – selling point is the balance we strike between a light-touch approach wherever possible and being more directional only when necessary. If parties are able to take care of themselves, as many are, we look to be in their way as little as we can. It’s not a one-size-fits-all style of administration, which is something I experienced as counsel and arbitrator, so it’s interesting now to see the philosophy from the other side. We are also increasingly emphasising the truly international character of the LCIA. This is demonstrated not only by hires such as mine, but by the fact that we are now seeing parties choose non-London seats, which people should not forget is possible. We don’t want the institution to be perceived as being overly pro-London. Speculating about the future of international arbitration is a more comfortable activity than speculating about its present, because as long as we are not talking about the near future we will not be proved wrong, or be criticised for not knowing the unknowable. But are we really entitled to assert very much about the future when we in truth know so little about the present? We are indeed reduced to speculating about the present, and it is worth reflecting on the causes and consequences of finding ourselves in such a frustrating (and humbling) predicament. It’s an old chestnut: which is better, litigation or arbitration? This is the third attempt I have had at it. In the first, I wrote an article singing the praises of arbitration over litigation. In the second, I debated for the motion: ‘This house considers that litigation is better than arbitration’, at a Commercial Litigators Forum event. On that occasion, my opponent (now partner at Quinn Emanuel Urquhart & Sullivan), Stephen Jagusch, used the entirety of his allotted time to quote my article back at me. So I approach this question with caution. Weil, Gotshal & Manges has paid over £3m to settle a professional negligence claim made against it in late 2013 by private equity house Bancroft. The case was set to be heard before the commercial court in July but the US law firm agreed a confidential settlement that Legal Business understands to be between £3m and £5m. Will $50bn Yukos award lead states to pull out of international arbitration treaties? The landmark Yukos decision has forced governments to consider the consequences of entering into international treaties that allow foreign investors to take disputes to arbitration. With the likes of Indonesia and South Africa having already torn up agreements, Russia having withdrawn from the Energy Charter Treaty that gave the Yukos shareholders jurisdiction and India mulling an exit from bilateral investment treaties, could the $50bn award lead more states to withdraw their consent to arbitration? 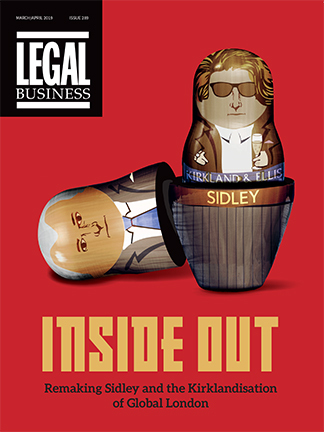 As banks remain in the crosshairs of regulators and claimants, Legal Business teamed up with Stephenson Harwood to seek the views of the in-house banking community on attitudes to disputes and risk. If you needed confirmation of just how challenging the litigation climate is for many of the world’s banks, then JPMorgan Chase’s results for the third quarter provided it, in all their billion-dollar detail. Announcing a $400m loss for Q3 in October, the bank revealed that it had set aside $23bn for litigation costs arising from a series of regulatory investigations, resulting litigation and economic crisis-related suits. An online dispute resolution (ODR) technology business spun out of eBay is setting up in the UK after receiving a $5m investment from venture capitalists.